Optical coherence Doppler tomography (ODT) is a promising neurotechnique that permits 3D imaging of the cerebral blood flow (CBF) network; however, quantitative CBF velocity (CBFv) imaging remains challenging. Here we present a simple phase summation method to enhance slow capillary flow detection sensitivity without sacrificing dynamic range for fast flow and vessel tracking to improve angle correction for absolute CBFv quantification. Flow phantom validation indicated that the CBFv quantification accuracy increased from 15% to 91% and the coefficient of variation (CV) decreased 9.3-fold; in vivo mouse brain validation showed that CV decreased 4.4-/10.8- fold for venular/arteriolar flows. ODT was able to identify cocaine-elicited microischemia and quantify CBFv disruption in branch vessels and capillaries that otherwise would have not been possible. A. Villringer, A. Them, U. Lindauer, K. Einhäupl, and U. Dirnagl, “Capillary perfusion of the rat brain cortex. An in vivo confocal microscopy study,” Circ. Res. 75(1), 55–62 (1994). O. B. Paulson, S. G. Hasselbalch, E. Rostrup, G. M. Knudsen, and D. Pelligrino, “Cerebral blood flow response to functional activation,” J. Cereb. Blood Flow Metab. 30(1), 2–14 (2010). C. Iadecola, “Neurovascular regulation in the normal brain and in Alzheimer’s disease,” Nat. Rev. Neurosci. 5(5), 347–360 (2004). R. G. Shulman, D. L. Rothman, K. L. Behar, and F. Hyder, “Energetic basis of brain activity: implications for neuroimaging,” Trends Neurosci. 27(8), 489–495 (2004). S. Ogawa, T. M. Lee, A. R. Kay, and D. W. Tank, “Brain magnetic resonance imaging with contrast dependent on blood oxygenation,” Proc. Natl. Acad. Sci. U.S.A. 87(24), 9868–9872 (1990). A. Devor, S. Sakadzic, V. J. Srinivasan, M. A. Yaseen, K. Nizar, P. A. Saisan, P. Tian, A. M. Dale, S. A. Vinogradov, M. A. Franceschini, and D. A. Boas, “Frontiers in optical imaging of cerebral blood flow and metabolism,” J. Cereb. Blood Flow Metab. 32(7), 1259–1276 (2012). V. J. Srinivasan, S. Sakadzić, I. Gorczynska, S. Ruvinskaya, W. Wu, J. G. Fujimoto, and D. A. Boas, “Quantitative cerebral blood flow with Optical Coherence Tomography,” Opt. Express 18(3), 2477–2494 (2010). 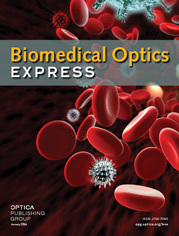 J. Lee, W. Wu, F. Lesage, and D. A. Boas, “Multiple-capillary measurement of RBC speed, flux, and density with optical coherence tomography,” J. Cereb. Blood Flow Metab. 33(11), 1707–1710 (2013). V. J. Srinivasan, D. N. Atochin, H. Radhakrishnan, J. Y. Jiang, S. Ruvinskaya, W. Wu, S. Barry, A. E. Cable, C. Ayata, P. L. Huang, and D. A. Boas, “Optical coherence tomography for the quantitative study of cerebrovascular physiology,” J. Cereb. Blood Flow Metab. 31(6), 1339–1345 (2011). H. Radhakrishnan and V. J. Srinivasan, “Compartment-resolved imaging of cortical functional hyperemia with OCT angiography,” Biomed. Opt. Express 4(8), 1255–1268 (2013). Y. Zhao, Z. Chen, C. Saxer, S. Xiang, J. F. de Boer, and J. S. Nelson, “Phase-resolved optical coherence tomography and optical Doppler tomography for imaging blood flow in human skin with fast scanning speed and high velocity sensitivity,” Opt. Lett. 25(2), 114–116 (2000). A. Mariampillai, B. A. Standish, E. H. Moriyama, M. Khurana, N. R. Munce, M. K. K. Leung, J. Jiang, A. Cable, B. C. Wilson, I. A. Vitkin, and V. X. D. Yang, “Speckle variance detection of microvasculature using swept-source optical coherence tomography,” Opt. Lett. 33(13), 1530–1532 (2008). A. Mariampillai, M. K. Leung, M. Jarvi, B. A. Standish, K. Lee, B. C. Wilson, A. Vitkin, and V. X. Yang, “Optimized speckle variance OCT imaging of microvasculature,” Opt. Lett. 35(8), 1257–1259 (2010). H. Ren, C. Du, and Y. Pan, “Cerebral blood flow imaged with ultrahigh-resolution optical coherence angiography and Doppler tomography,” Opt. Lett. 37(8), 1388–1390 (2012). R. A. Leitgeb, L. Schmetterer, C. K. Hitzenberger, A. F. Fercher, F. Berisha, M. Wojtkowski, and T. Bajraszewski, “Real-time measurement of in vitro flow by Fourier-domain color Doppler optical coherence tomography,” Opt. Lett. 29(2), 171–173 (2004). H. C. Hendargo, R. P. McNabb, A.-H. Dhalla, N. Shepherd, and J. A. Izatt, “Doppler velocity detection limitations in spectrometer-based versus swept-source optical coherence tomography,” Biomed. Opt. Express 2(8), 2175–2188 (2011). E. Koch, J. Walther, and M. Cuevas, “Limits of Fourier domain Doppler-OCT at high velocities,” Sens. Actuators A Phys. 156(1), 8–13 (2009). Z. Yuan, Z. C. Luo, H. G. Ren, C. W. Du, and Y. Pan, “A digital frequency ramping method for enhancing Doppler flow imaging in Fourier-domain optical coherence tomography,” Opt. Express 17(5), 3951–3963 (2009). K. Itoh, “Analysis of the phase unwrapping algorithm,” Appl. Opt. 21(14), 2470 (1982). A. Bouwens, D. Szlag, M. Szkulmowski, T. Bolmont, M. Wojtkowski, and T. Lasser, “Quantitative lateral and axial flow imaging with optical coherence microscopy and tomography,” Opt. Express 21(15), 17711–17729 (2013). D. Piao, L. L. Otis, and Q. Zhu, “Doppler angle and flow velocity mapping by combined Doppler shift and Doppler bandwidth measurements in optical Dopplertomography,” Opt. Lett. 28(13), 1120–1122 (2003). S. G. Proskurin, Y. He, and R. K. Wang, “Determination of flow velocity vector based on Doppler shift and spectrum broadening with optical coherence tomography,” Opt. Lett. 28(14), 1227–1229 (2003). L. M. Peterson, S. Gu, M. W. Jenkins, and A. M. Rollins, “Orientation-independent rapid pulsatile flow measurement using dual-angle Doppler OCT,” Biomed. Opt. Express 5(2), 499–514 (2014). W. Trasischker, R. M. Werkmeister, S. Zotter, B. Baumann, T. Torzicky, M. Pircher, and C. K. Hitzenberger, “In vitro and in vivo three-dimensional velocity vector measurement by three-beam spectral-domain Doppler optical coherence tomography,” J. Biomed. Opt. 18(11), 116010 (2013). H.-G. Ren, C.-W. Du, Z.-J. Yuan, K. Park, N. D. Volkow, and Y.-T. Pan, “Cocaine-induced cortical microischemia in the rodent brain: clinical implications,” Mol. Psychiatry 17(10), 1017–1025 (2012). T. Wu, Z. Ding, L. Wang, and M. Chen, “Spectral phase based k-domain interpolation for uniform sampling in swept-source optical coherence tomography,” Opt. Express 19(19), 18430–18439 (2011). V. X. D. Yang, M. L. Gordon, A. Mok, Y. Zhao, Z. Chen, R. S. C. Cobbold, B. C. Wilson, and I. Alex Vitkin, “Improved phase-resolved optical Doppler tomography using the Kasai velocity estimator and histogram segmentation,” Opt. Commun. 208(4–6), 209–214 (2002). G. K. Batchelor, An Introduction to Fluid Dynamics (Cambridge University Press, 2000). T. N. Kim, P. W. Goodwill, Y. Chen, S. M. Conolly, C. B. Schaffer, D. Liepmann, and R. A. Wang, “Line-Scanning Particle Image Velocimetry: An Optical Approach for Quantifying a Wide Range of Blood Flow Speeds in Live Animals,” PLoS ONE 7(6), e38590 (2012). Fig. 1 A schematic of spectral-domain μOCT system for simultaneous 3D μODT and μOCA imaging. CM: collimator, D: dispersion compensator; FPC: fiber polarization controller, L1, L2, L3: achromatic lenses, G: servo mirrors. BS: beam splitter. Fig. 2 A sketch of new image acquisition and processing GUI to enable instantaneous display of 3D ODT of the quantitative CBFv network. a) Diagram of multi-threading structure with 6 sub-threads running separately with inter-thread data synchronization. b) Screen capture of GUI control panel during scanning CBFv network in vivo. Fig. 3 Numerical method for vessel tracking and least-squares fitted angle correction. Vessel skeleton (b) was generated by centroid tracking of the raw data (a). 2D (c) and 3D (d) curve fitting was applied to smoothen raw vessel skeleton extracted by centroid tracking technique, i.e., blue dots in (d). As result of two-step fitting, a vessel skeleton f(x,y,z) was obtained in (e). (f): Doppler angle |cosθz(x,y,z)| was calculated by Eq. (9) and further smoothened by Fourier curve (red line) to avoid extreme case when cosθz = 0. Fig. 4 Comparison of time partition between data acquisition thread and phase reconstruction threads. Fig. 5 Phantom flow study (1% intralipid, ϕ280µm tubing) to demonstrate that phase summation method enhances the sensitivity for slow flow detection and increases the dynamic range for fast flow detection. All images are projected onto same phase scale [0, π] for comparison. Fig. 6 Results of flow phantom study (1% intralipid, ϕ280µm tubing) to show that angle correction using gradient vessel tracking dramatically ~9.3-fold reduces the error in flow rate quantification. Fig. 7 3D ODT image of quantitative CBFv network on a mouse somatosensory motor cortex (1.9 × 1.5 × 1mm3). Left panel: 3D CBFv image without angle correction; Right panel: comparison of flow rate correction for a vein and an artery. Fig. 8 3D OCA images (upper panels) and 3D ODT images (lower panels) of the somatosensory motor cortex (2 × 1.5 × 1mm3) from a control mouse (left) and a chronic cocaine treated mouse (right), showing significant decreases in the entire CBFv network. Dashed circles show examples of vasoconstriction. Fig. 9 Ratio image to quickly track the ROIs, e.g., vessels with drastic flow decrease after repeated cocaine administration (2.5mg/kg/ea, iv). a) baseline CBFv image, b) currently updating CBFv image, c) ratio image of (b)/(a) to identify flow disruptions, d) statistical analysis of CBFv decrease. White dashed lines: ROIs with diminishing flows.